INDIANAPOLIS – To no one’s surprise, NorthWood all-everything Bronson Yoder was among the elite football players in the state when it came time for the Indiana Football Coaches Association to hand out its annual awards. Yoder, listed as a defensive back, was among the Top 50 All-State for 2018 by IFCA. There was a case he could have made both sides of the ball. Yoder had 29 solo and 62 total tackles, seven interceptions and a touchdown return for the Panthers, among a crowded stat list. On the other side of the ball, Yoder amassed over 2,876 yards from scrimmage and 28 touchdowns, 2,310 of those yards running the ball, which lists as sixth-best in the state. Yoder also threw for 427 yards and six touchdowns and caught 12 passes for 139 yards and two scores. 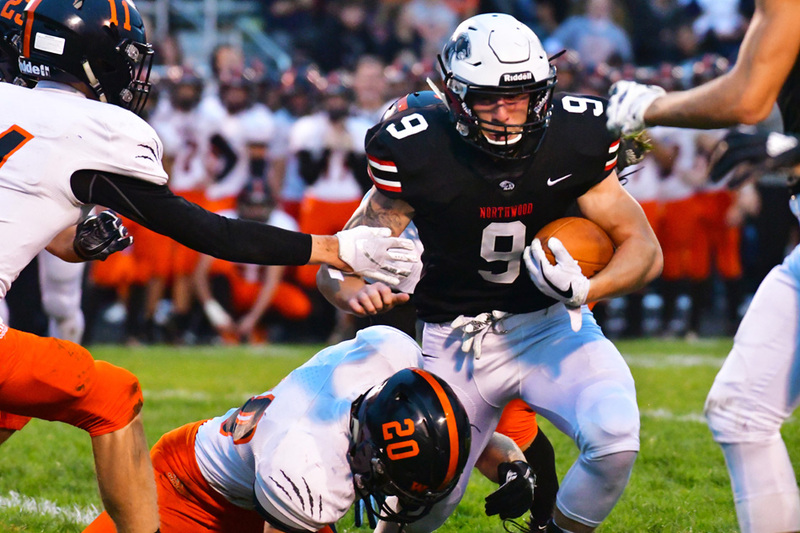 Five other area players were named to the Top 50, including Pioneer quarterback Jack Kiser and linebacker Daniel Gregorich, Culver Academy defensive lineman Deontae Craig and Mishawaka all-time rushing leader, running back Chris Harness. The All-State teams for each class were also announced, with several area players making the cut. In Class 1-A, Triton had four players named to the Senior All-State in lineman Connor Ousley, quarterback James Snyder, wide receiver Delano Shumpert and defensive back Tye Orsund. Southwood’s Aiden Ortega, LaVille’s Riley Wagoner, Pioneer’s Conner Walker and Churubusco’s Tanner Allen and Joey Emenhiser were also on the 1-A list. Tippecanoe Valley’s Jace Potter was named to the Junior All-Stars as a defensive lineman. NorthWood had both Jaden Miller and Jake Lone named to the Junior All-Stars as defensive back and defensive lineman, respectively. Warsaw had John Culbertson named to the Senior All-State team as a defensive lineman and kicker Harrison Mevis tabbed to the Junior All-Stars. Among other area players making the respective list for Class 2-A were Bremen’s Nathan Miller, Jacob Wunder, Justin Zumbrun and Sam Huffman, and Rochester’s Zane Gilbreath. In Class 3-A were Jimtown’s Tyler Norment, Blake Garretson and Clay Campbell, Mishawaka Marian’s Zack Whitfield, Michael Gibson, Miguel Ortiz and Hunter Renner, Knox’s Dawson Patrick and Jared Prater, and West Noble’s Brandon Pruitt. In Class 4-A were Culver Academy’s Amari Curtis, Mishawaka’s Richard King, Sam Shively, Carl Fisher and Tyler Rux, South Bend St. Joe’s Mark Hiestand, South Bend Riley’s Jalen Jennings and Gavin Luuga, East Noble’s Kaiden Harshberger, Angola’s Luke Honer, Ryan Brandt and Kyle Trick, New Prairie’s Jacob Tuttle, Chase Ketterer and Hunter Whitenack, and Plymouth’s Seth Rudnell and Joe Barron. In Class 5-A were Elkhart Central’s Ricky Rocha, Goshen’s Daveyon Sandford and Concord’s Carter Neveraski. In Class 6-A were Penn’s Ashton Bradley, Brock Boynton, Adam Berta and Ryan Williams.